Preheat the oven to 500°F for one hour. In a small bowl, dissolve the yeast in a pinch of sugar and ¼ cup of warm water. Let stand until foamy, about 5 minutes. In a large bowl, combine the flour, salt, and olive oil. Stir in the yeast mixture, then 1 cup of water. Work the dough into a firm ball. Cover with a moist towel and let rise until double, about 1 hour, depending on the climate. Divide the dough in half and roll it out onto a floured work surface. If you have Wondra flour, that is best for rolling. Grease 2 baking sheets or pizza stones with olive oil and lay the dough into each. 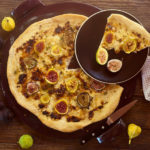 Distribute the fontina, figs, thyme, honey, vinegar, and salt evenly on each pizza. Drizzle with olive oil and brush it over the outer crust so that it browns nicely. Bake the pizza in the oven for 10 minutes, then reduce the temperature to 400°F for about 10 minutes more. Serve hot.